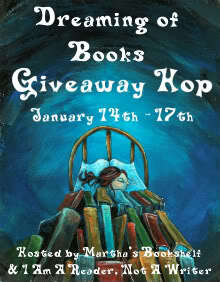 The Dreaming of Books Giveaway Hop begins today (1/14) and ends on Monday, January 17th at midnight. This hop is hosted by Reviews by Martha's Bookshelf & I Am A Reader, Not A Writer. ReaderGirls is giving away a hardcover copy of The Haunted, The Hollow #2 by Jessica Verday. Summary: An impossible truth. An impossible love. If you loved The Hollow, this second installment in the series is recommended! Our contest is open internationally. One entry per person. You must be a follower to enter. Please check out the other blogs participating in the Hop. Good luck! Enter here. Contest has ended. Ohhh.. Great book.. loved the first one and haven't gotten to this one yet... Thanks for the chance! Thanks for the giveaway!I love the cover on this one! Thanks for giveaway, Happy Friday! Everyone is welcome. Good luck! Thanks for stopping by:) Happy Friday! !